It appears Amazon is joining Hulu and Netflix with a monthly subscription plan for its Prime video streaming service, according to a new pricing scheme found by Hacking Netflix. Some users are seeing the new pricing scheme come up, while others see only the $79/year options (compare right and above). Amazon also offers a one-month free trial (Hulu free trial, Netflix free trial). 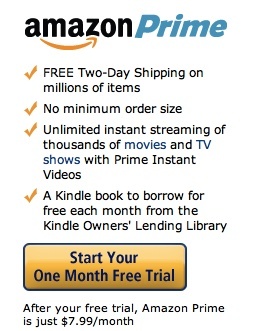 In addition to the free streaming video service, users of Amazon’s Prime get access to free two-day shipping on product orders (amazing to have for the holidays—especially on a month-to-month basis), as well as access to the Kindle lending library. While Amazon’s streaming player isn’t yet available on Apple TV like Netflix/Hulu, its recent iPad app has impressed us. The $7.99/month price comes out to $95.88 per year. So, if you aren’t timid about joining Prime, it is probably better to jump on the $79/year plan.